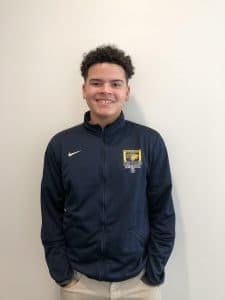 When we sat down with Josian Quianes on a beautiful fall afternoon in a quiet corridor at BVP High School, we expected to talk about his senior year and the college application process: the preparation and the challenges; his course load and career aspirations; early decision and the months ahead. But what began as a typical Q&A, quickly turned into something greater: a personal narrative of determination and perseverance in the face of adversity. Josian and his family migrated from Puerto Rico when he was just four years old. From a young age, he watched his mother struggle to adapt to her new life in Rhode Island. The language barrier, he recalls, was a particular challenge; seemingly ordinary tasks like grocery shopping and interacting with a cashier caused deep-seated embarrassment. However, despite the obstacles, Josian recounts her work ethic – waking up early and coming home late in an effort to put food on the table and a roof over his family’s head. Josian’s innate compassion and propensity for empathy, in the face of sometimes relentlessly challenging personal circumstances, shapes how he sees and interacts with the world around him and is nothing short of inspiring. Josian believes in the power of community and in the foundational ethos of BVPHS – that, together, as a team and family, we can out hustle the world. It’s safe to say his hard work and grit are paying off. Josian has gained admission to three colleges so far: Providence College, Western New England University, and Worcester Polytechnic Institute, a school he’s had his eye on for quite some time. To be clear, Josian says he’s open to different types of engineering, not just civil. Ten years from now, he envisions himself living in the area and working on engineering projects for a local company. Josian’s strong desire to consistently challenge himself with rigorous material is matched only by his tireless work ethic.